Oxmoor Toyota is proud to offer the new Toyota Camry, a rock star of a midsize sedan sporting exceptional fuel economy and room for the whole crew. Our new inventory boasts an attractive lineup of new Toyota models, with the Toyota Camry taking a front seat for sleek styling, superior visibility, and reliable powertrain. This Toyota sedan is one terrific option in a lineup of high-performing new vehicles in Louisville, Kentucky. You can even compare the Toyota Camry to the Toyota Corolla with our helpful research pages. 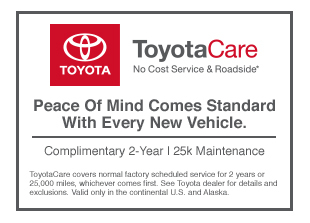 Contact our Louisville, KY Toyota dealership to schedule an unforgettable test drive. Our new car dealership offers convenient and helpful tools to set you on your way to a new Toyota Camry, Toyota Tacoma, or Toyota RAV4. View new vehicle specials for values on select new vehicles, then use our payment calculator to estimate your monthly payments. Don’t forget to value your trade to access cash you can apply toward your new purchase at Oxmoor Toyota. Interested in leasing a new Toyota Camry? Contact our Louisville, KY auto finance center to work out a personalized finance plan! Get the ball rolling by filling out our secure online finance application. Our Louisville, KY finance team will help you maximize your budget and your lifestyle with the loan or lease that makes sense for you. Browse new cars online, then apply for financing at Oxmoor Mazda today.